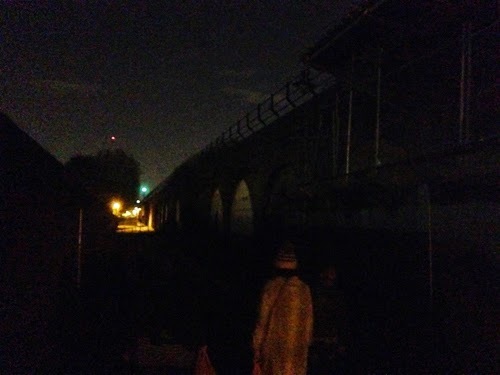 While on Deptford High Street there is a shortage of Christmas lights, at the Ha'Penny Hatch where Lewisham meets Greenwich over Deptford Creek, there have been NO LIGHTS AT ALL since the beginning of October (or is it longer?). The picture above is from 9th November. There's no change. Fortunately, as far as we know, with darkness descending at 4pm or sooner, the only remotely bad thing that has happened is graffiti artists having a party or two (and leaving all their litter, which is also never cleared up). But it's almost three months since this path has been lit. Usually this is the sort of thing you could post to Love Lewisham, but it is not so simple. Firstly this path has no postcode – so they can't find it and you can't use their interactive map to report it. More importantly, neither can the police if something awful happens here in the darkness. Secondly, you have to report the number of the nearest lamppost that has a number written on it (back on Crossfields) because none of the lampposts on the path have numbers. 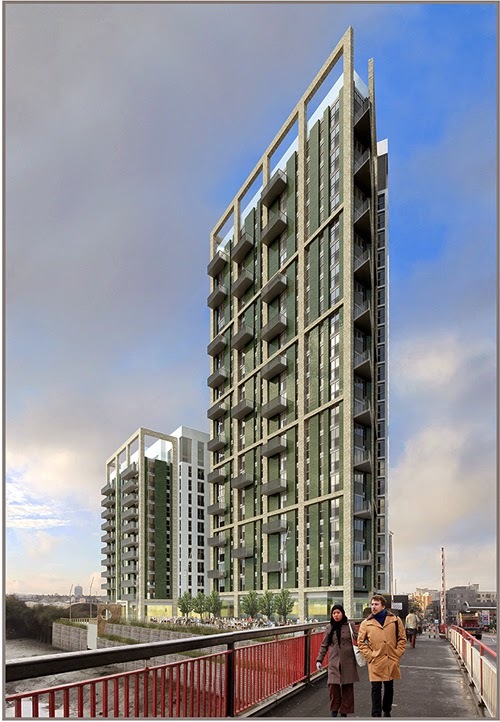 We would normally have been reported it ourselves, but we have been waiting to see how long it takes for someone else to do it for a change – or to see if Lewisham notice it themselves! It's a very important path since it forms part of the GLA's Cycle Quietways. In fact TWO so-called Quietways are offered at the Creekside end of the route across the Ha'Penny Hatch (one of which is through Crossfields – the maintenance of some of the path has been paid for by the leaseholders who were never even consulted). Strangely, that path is the responsibility of Greenwich Council even though it's in Lewishame, and roadworks to accommodate it across Deptford Church St are still being carried out by Greenwich, months after the work was started. Lewisham Homes wasn't even told about it. (Not that them knowing now makes any difference since they would hardly tell us). However, cyclists using the Ha'Penny Hatch usually have their own lights. Pedestrians do not. (This story was originally posted as part of the previous post). Do They Know It's Christmas? Where are the festive lights on our High Street? OK, so the cuts have taken their toll. 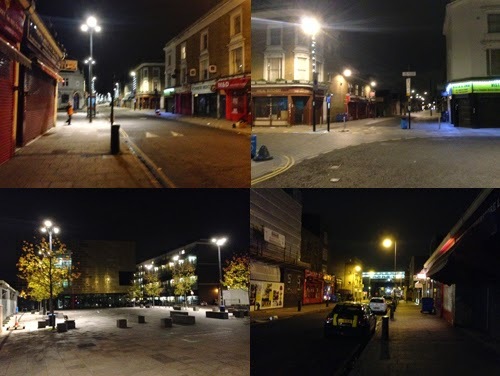 No Xmas lights for Deptford High Street. Just the south end – the lights came on (as they have for the past week) just as the Wednesday market was finishing today. Nothing in Giffin Square or Douglas Way. Obviously no Christmas tree here, that would be excessive (and of course attracts street drinkers, so we can't have that). Nothing from the Giffin St junction down to the very bottom (or very important north) of the high street where there are a couple of lampposts with a twist of lights as it meets Evelyn Street. In fact there is a twist of lights down there with no bulbs attached to their sockets. Cuts? Incompetence? Lack of care? Couldn't one of Deptford's millionaires sponsor some lights? Did no one from Lewisham ask HSBC? Barclays? Poundland? 99p Store? Iceland? Tesco? Cathedral (cashing in already on Deptford)? Hutchison Whampoa (Convoys Wharf owners about to cash in)...Waitrose even? Just who the f**k is running this high street anyway? The "Deptford Society" don't appear to know. Who at Lewisham is responsible? No doubt Lewisham Gateway (latest phase 0% affordable housing), Lewisham centre and Catford are bountifully lit up (we've no idea because we avoid these areas like the plague). 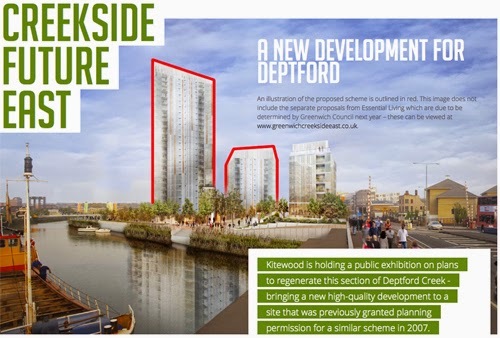 But Deptford, non! And no bloody explanation or apology either! (We've edited this post. A related story about no lights on the Ha'Penny Hatch is now a separate post). Our mate Fred called the council but didn't really get a definitive answer – the chap he spoke to didn't really know and could only guess. There might be three reasons, he said. 1. The lights were found to be not fit for purpose (bulbs missing?). 2. It might be Skanska's fault (they have the contract for street lighting). Skanska have put in new lamps at the south end of the street but have not yet replaced the old lampposts at the north end. 3. It was more likely to do with cut backs. On average, Xmas lights might cost between £12-£15k (to run or to install, he didn't say). Residents could apply for money from Ward Assembly funding, get their Ward Councillors to apply for funds. Or residents could approach a developer to sponsor. As one commenter below has said, we're an enterprising and creative community in Deptford. If we had known in advance there would be such a poor show, we might have found an alternative way to bring a bit of festive cheer to the rest of the street. Deptford Fowlers Troop do a kind of morris dancing as part of a tradition associated with Plough Monday, the first Monday after Epiphany. Molly dancing began with out of work ploughboys touring around villages offering the landowners the opportunity to pay them to dance instead of plough (since there would be no ploughing till Spring). If the landowners refused them money, they might find their garden lawns ploughed up, so the dancers would conceal their identities by blacking their faces with soot and dressing up in a variation of their Sunday best, with one of the members – the Molly – dressed up as a woman. 12.00: at the Royal Albert, 460 New Cross Road with dance commencing at 12.30. Now in its fifth year, this Greenwich event has grown in size (though the contestants remain smallish in numbers – they're hoping for between 20 and 40 this year). Lots of comedians and showbiz personalities get involved. This year the festivities begin with a science fiction themed opening ceremony at 11am. Stormtroopers (including Darth Vader) will march from the Cutty Sark to Devonport House where the race will start at 1pm. 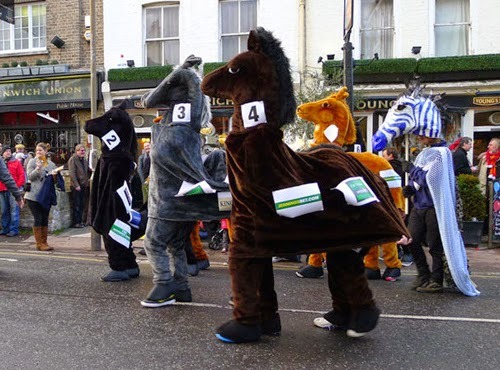 The panto nags then race to the Union Bar on Royal Hill. An after-race party hosted by comedian Stephen Frost starts at 2.30pm at the Greenwich Tavern next to Greenwich Park (£12 on the door). The event raises money for Demelza Children's Hospice – for more details and to see the route go the website! 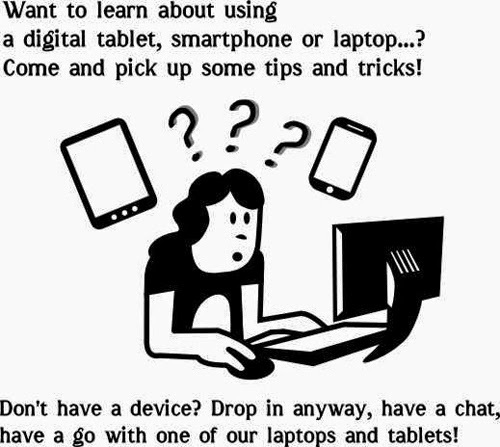 The Digital Lab is a new club-type space for Crossfields tenants who need some advice and help with using their digital devices, whether it's a laptop, tablet or smartphone (Android or iPhone). Local IT trainer Paul Clayton will be setting up a club at the Pink Palace in the new year but in order to get this off the ground, he needs to know how many Crossfields residents are interested. Paul says "Residents can come to the club with their own devices, or pop in and use the laptops and tablets I'll be setting up. I'll be doing a couple of talks about useful topics such as using wifi and keeping your laptop cleaned up. Internet will be provided via a 3G modem – which limits the numbers of people who can be online to around five – but all are welcome. You may just want to pick up some tips on typing! I'll have some accessibility software, big keyboards and trackballs which are useful for older people or people with low vision, and for those with limited movement. So, if anyone gets a digital gadget for Christmas this year, the club will be a perfect place to show it who is boss!". The hope is to get it started in late January. Paul already has some interested tenants, but needs a few more to make a case to get funding before setting the date and time. It's intended that the drop-ins will last 6-8 weeks. If you or someone you know is struggling with their gadgets, get in touch with Paul on 07958 251448 or email paul.clayton@soulchip.co.uk. We've slagged off her landlord in the previous post, but we wish only the best to Caffy St Luce and her latest Rocklands project Number3Live Sessions launching at Number 3 Creekside this evening (and continuing 12th and 19th December). The bill tonight is Rhiannon The Nightmare, Jean Genie's Massive Hugs, James Fisher and DJ Gavin Black. It's free entry, doors are 7pm. Despite the planning application being unresolved, the licensing is in place, so it's likely to be a late one, and a good opportunity for the nearby Crossfields residents to test the sound and noise barriers! Here's hoping their evenings won't be disturbed, and everyone has a great time. Artwise, it's Christmas Open Studios at Cockpit Arts – lots of visitors expected as usual as people come from far and wide to pick up classy and crafty Chrismas presents at studio prices at Numbers 18-22 Creekside. It's free entry from 11am till 9pm today but a £3 ticket price over the weekend (which allows entry both days, Sat & Sun 11am-6pm). APT Gallery at Number 6 Creekside and Arthub Studios at Numbers 5-9 Creekside hope to attract some of these visitors to their own Christmas sales – though of course it might be the other way round! APT were open late for 'SLAM Last Fridays' last weekend and the traffic on Creekside was terrible! Tonight they'll be open from 6–8pm and 1-5pm on Sat & Sun. Arthub Studios & Gallery's 'Snap it up!' 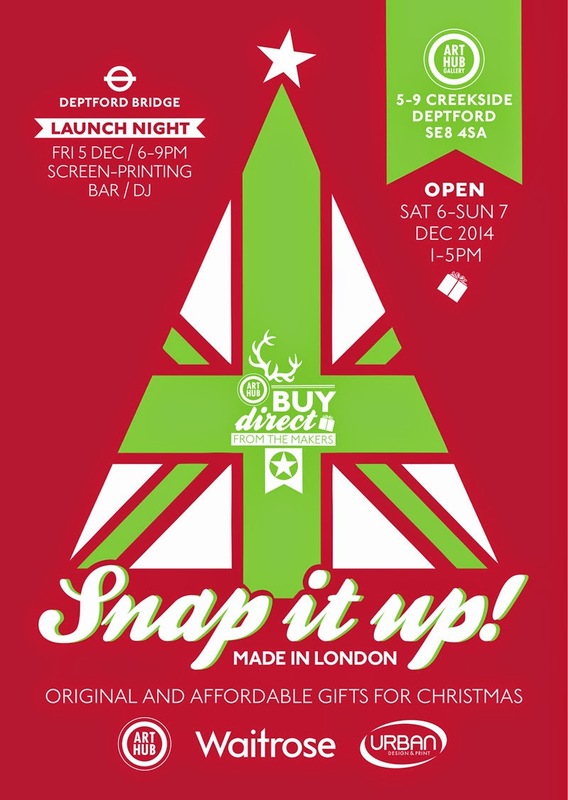 offers a free glass of mulled wine this evening (6-9pm), a DJ and some 'screen printing' (not sure what that means!). Then they're open 1-5pm on the weekend. Next week on Saturday 13 December, there's a Winterfair at the Arthouse and a Vintage Christmas & Craft market at The Albany.